You will receive an e-mail alert when the price of Elex will drop. 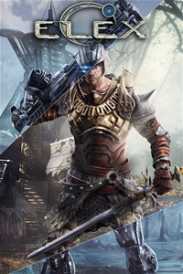 Elex is a vast Open-World RPG full of freedom and choices from the award-winning creators of the Gothic series, set in a brand new post-apocalyptic Science Fantasy universe. Freedom of choice: Help, betray, or even kill whoever you want, and see how the ripple effects will change the course of the story. Freedom of movement: Use the jet pack to attack from mid-air, to reach hidden places, or to jump from incredible heights and still land safely. Freedom of character development: In Elex you’re not limited to a certain class of hero – you can become whatever you like. Freedom of exploration: The whole world is open for exploration from the very first moment on, and there are no barriers or loading screens. Freedom of weapon choice: Elex offers one of the widest selection of weaponry in the history of RPGs. From swords, bows, and hammers to shotguns, grenade launchers, and even flame throwers – there’s a weapon style for everyone – and of course there’s magic.